LEAK-FREE=NO BUTTER ON CLOTHES. 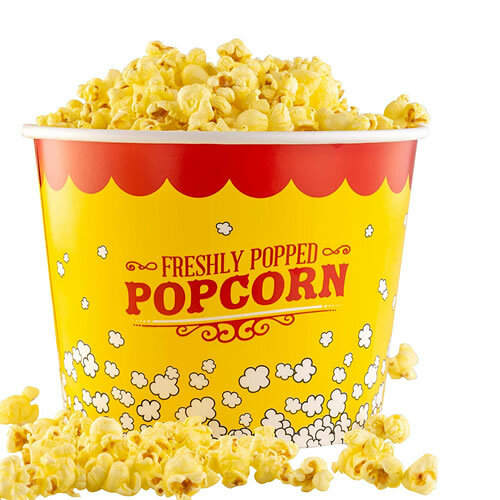 Our grease proof cups let you and your customers enjoy your popcorn without worry about butter or grease looking through onto clothing. EASIER TO USE THAN POPCORN BAGS. No need to worry about opening a small bag and fitting popcorn into the narrow hole at the top. Simply grab the cup off of the top of your stack and fill the wide opening with popcorn. BUY IN BULK AND SAVE. Save money by stocking up with our 25 pack. PERFECT FOR SHARING. From date nights on the couch to school carnivals to large sporting events our large popcorn buckets are the perfect size for sharing.